I live within the limits of a small town that is still mostly rural, about 12 miles from where I grew up and where I work. It’s really the best of both worlds. I’m close enough to restaurants, entertainment, etc., but my neighborhood is quiet, spacious and dark at night. There are plenty of wooded areas where I can cut greenery for my Christmas wreaths. One of my favorite things in the area are the active farms. I like watching the seasons change based on what is happening to the land. 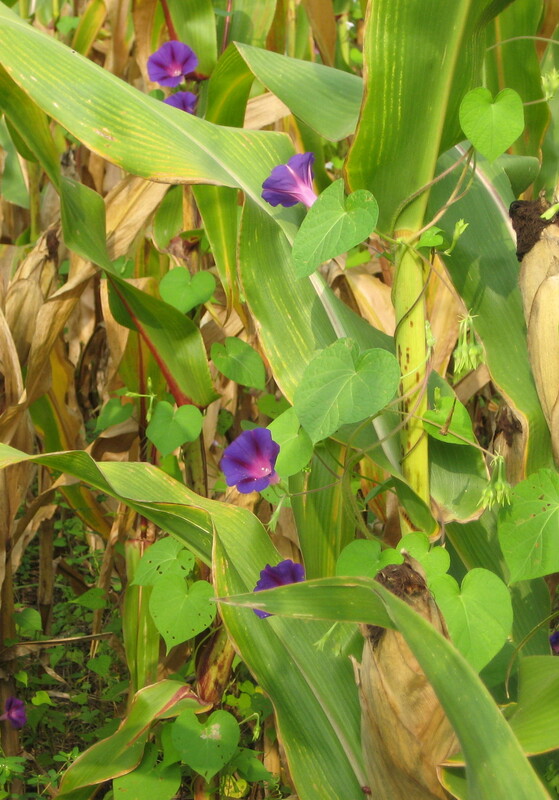 Driving to work one morning, a pop of color caught my eye and as I looked more closely I saw small circles of white, fuchsia and deep purple peeking through the leaves of the corn plants. Wild morning glories! And right now they are blooming gloriously every morning. The more I searched, the more I saw. In some places, the vines are clumped together and it’s easy to see a large splash of color. In other spots, the face of the bloom peeks out at you, an unexpected gift. Morning glories are like happy faces, welcoming the new day. If you don’t look for them early, you won’t see them in the afternoon. If you don’t have any, you can sow some seeds. Toss them with abandon and next year, you’ll enjoy random acts of beauty. I have a penchant for yard art and it has grown over the last few years. Now, a little class in selection is important and it should not be overdone. While remembering the gnomes in the movie The Full Monty still makes me laugh, I don’t want creatures peering at me from every natural area. One of my neighbors has some cool, life size metal art in the backyard that blends in well. I like those tools (shovels, saws, etc.) that talented people have turned into garden animals. And I will admit to having a plastic pink flamingo that comes out for special occasions or as needed to bring sunshine (annoy) those who have a limited sense of humor and clearly need some help. But my favorite is this fella who I have named Trex (the husband has named it Dina). I pass him every week. 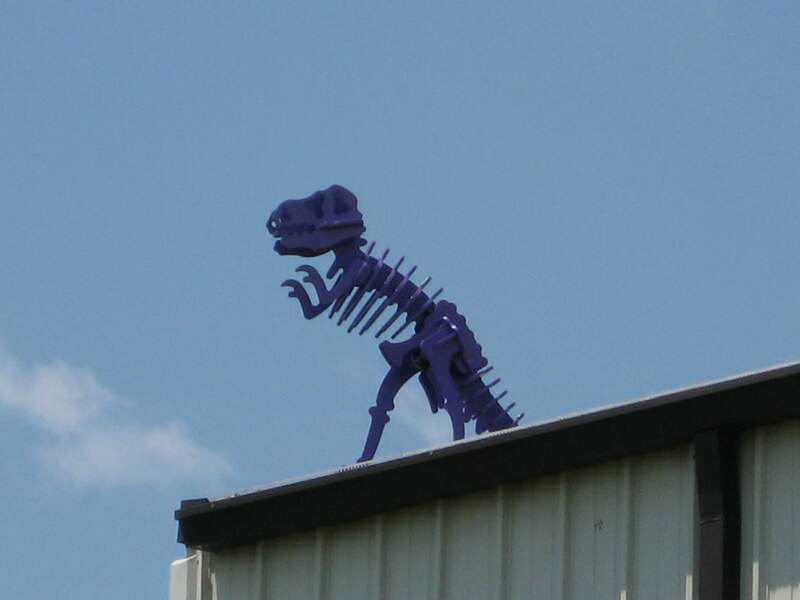 He’s perched on the corner of the roof of a business that makes coatings for iron products. I have no idea how long he has reigned in this spot, but I noticed him a couple of years ago. His strong purple color pops against a beautiful blue sky. I look for him almost every time I pass that building. And for whatever reason, every time I see him up there, I hear the refrain from George Gershwin’s Someone To Watch over Me. If the company ever decides to get rid of him, I hope I can bring him home to my yard. I know I can find just the right spot. I’m paying attention. Are you? Welcome to The Sunny Side, the beginning of a collection of the little, often unappreciated experiences that bring joy to everyday living! My husband often tells me to focus. His definition? Pay attention (mostly me) when someone else is sharing something (mostly him). He, often in exasperation, will tell me to “smell the roses” (I run around like a headless chicken most of the time). I cannot say I have made much improvement in the focus area, but I have been paying much more attention to the world around me. And that has led me to start this blog. The name is taken directly from a favorite old song, Keep on the Sunny Side, written in 1899 by Ada Blenkhorn and recorded by the Carter family in 1928. It was introduced to a new generation of listeners in the movie O Brother, Where Art Thou? The original lyrics are below and you can enjoy many performed versions on youtube. Who keepeth everyone in His care. Who knows what odd, weird, memorable “something” will we see or hear this week? I don’t know, but I’m paying attention! Are you?